With the arrival of my new Klean Kanteen yesterday (I got the classic in active pink! ), I am inevitably going green. The days of the plastic spring water bottle are numbered — at least in my yoga class. No longer do I have to go to class, feeling self-conscious for being (almost) the only yogi who still buys water that comes in disposable plastic bottles! Go me! I can now say that I am one step closer to truly embracing the trend of “going green.” Well, not really. I bought myself a stainless steel water bottle because I didn’t see the sense in continuing to spend money every week on a new bottle of spring water that I can use over and over for the week. Okay, so my decision more came from a place of trying to be frugal than going green…but in the end it still helps the environment, right? Right. And now that I have wasted a paragraph’s worth of time on an anecdote about my new stainless steel water bottle, you may find yourself asking — what’s this got to do with baking??? Well, I’ll tell you. My baking has also gone green! 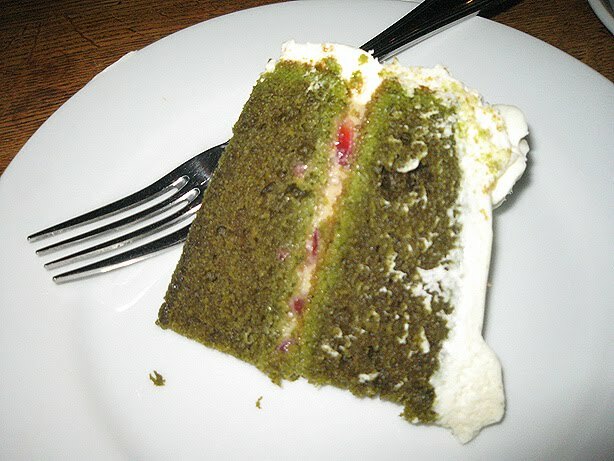 I give you the green tea cake. In batter form. May was a month of birthdays — two birthdays, actually. The first was my friend K’s birthday, and because I know she likes indulgent foods with a “healthy” twist, I decided to make her a green tea cake. 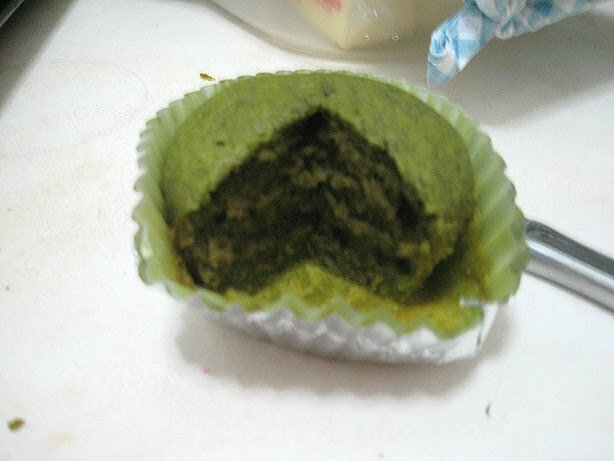 Having so much matcha powder left over from my previous green tea project(s), I was glad to have another use for the expensive ingredient. Before making the actual cake, I wanted to test the recipe, so I made the cake recipe into cupcakes and brought them in to work. The original recipe had much less matcha than my own version of it, and I’m glad I followed my instincts to pump up the matcha volume, because everyone loved the way the green tea flavor came out so clearly and unmistakeably. 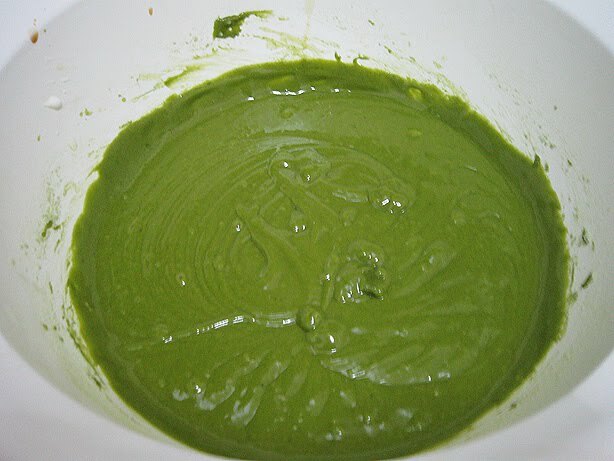 Reviews of the original recipe included complaints that the matcha content was not high enough in the original recipe. Having met with very positive reviews from my guinea pigs at work, I decided to press on with the actual cake. This was only my second time making a birthday cake, the first time being for a coworker’s 50th birthday, but the decorating work was far better than the first time, I would say. The frosting was actually an interesting one that I found on the internet — a hybrid of a cream cheese frosting and a whipped cream frosting. I was intrigued because the original recipe promised to be a “sturdy” whipped cream frosting, and I wanted a frosting with a flavor that wasn’t going to overwhelm the green tea and completely mask it. I increased the almond extract in the recipe because I wanted an almond frosting. 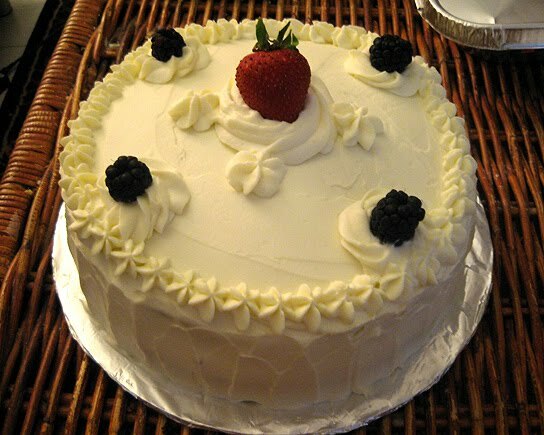 A word to those who don’t want to have to throw away their first batch of frosting… Some recipes, when they say to use reduced fat or nonfat ingredients, are not always that way because they were written by a finicky person concerned over his or her waistline. No, sometimes there is actually a sound reason for doing so that has nothing to do with one’s waistline. I found out the hard way by ignoring the original recipe’s call for reduced fat cream cheese. I thought, “Psh, what difference could it possibly make?” A whole world of it. True, it could be because I used defrosted heavy cream (which does not return to original, pre-frozen consistency, consisting instead of lumpy, clumpy, but still usable cream) and the cream’s altered consistency contributed to its failure to thicken properly (something to do with its inability to form air bubbles, perhaps?). In any case, I had to throw out my first batch of the frosting (a soupy, soupy disappointment). An excellent argument for following the rules (well, this time). * Note: If you want to make a full, two layer cake, simply double the cupcake recipe, pour into two 8-inch round baking pans and bake at 350° F for 30-40 minutes. 1. Preheat oven to 350 degrees F. Line 12-cup cupcake pan with 12 cupcake cups. 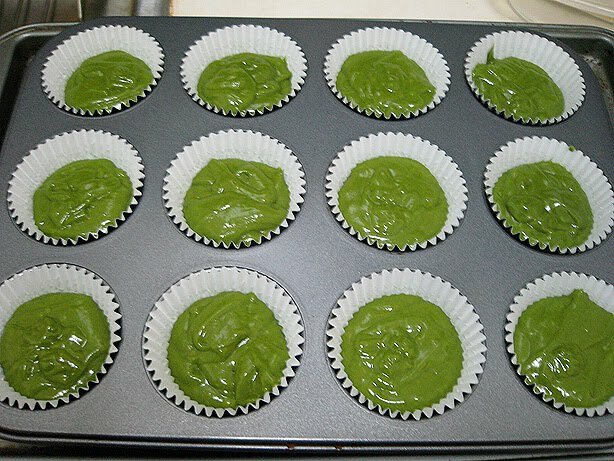 Sift together the all-purpose flour, cake flour, baking soda, salt, and green tea powder; set aside. 2. In a large bowl, beat together sugar, oil, and eggs until smooth. Stir in 3/4 teaspoon vanilla. Beat in the flour mixture alternately with the yogurt, mixing just until incorporated. 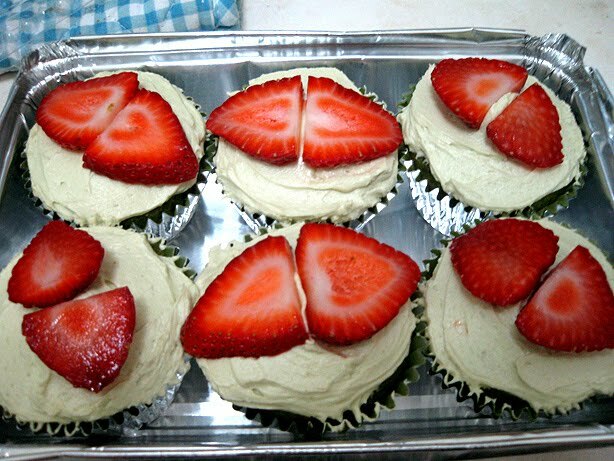 Fill each cupcake cup about halfway with batter. 3. Bake in the preheated oven for 20 minutes, or until a toothpick inserted into the center of cupcake comes out clean. Cool on wire rack for 30 minutes before removing. 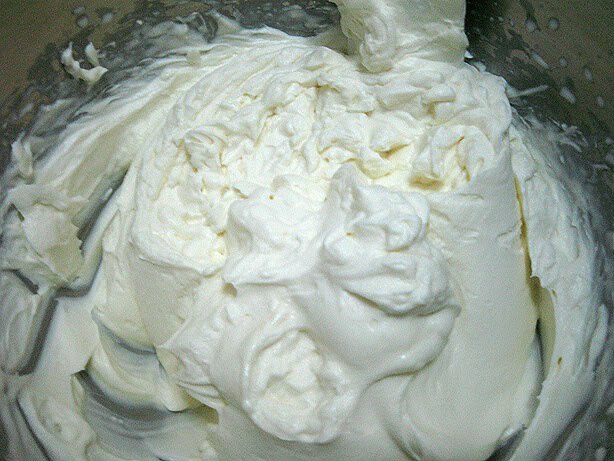 1.Combine the cream cheese, sugar, vanilla extract and almond extract in a large mixing bowl or the bowl of a stand mixer. 2. Fit the mixer with the whisk attachment and mix on medium speed until smooth. 3. While the mixture is still whipping, slowly pour in the heavy cream. Stop and scrape the bottom of the bowl a couple of times while you continue whipping until the cream can hold a stiff peak.